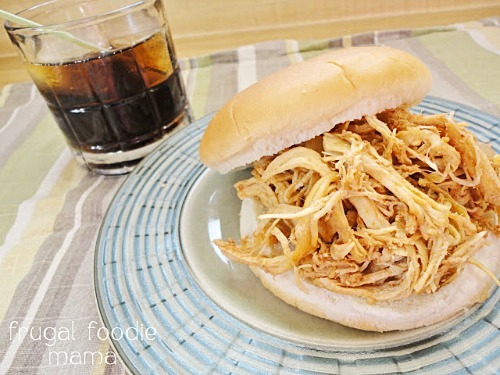 Take the hassle out of making dinner with these Ten Super Simple Crockpot Chicken Recipes! I love my crockpot. Don’t you love yours? Oh you don’t have a crockpot? Well after you’re done checking out these rad recipes, head on over to my Summer Crockpot Recipes Post and get yourself entered to win a 6 quart programmable crockpot! We all love super simple recipes, am I right? After a long day at the job or lugging the kiddos around, who wants to spend a ton of time in the kitchen? Well, I’ll admit, sometimes I do. But there are days that I do not want to spend a ton of time in the kitchen. Sometimes I like to be lazy. That’s where my handy dandy crockpot comes in. I just throw some ingredients into it, turn it on and go on my merry way. At times there is some minor prep work but it still beats tons of pots, pans and mixing bowls and a lengthy meal preparation process. I can guarantee that! I like to eat healthy and I know a lot of you do as well. So I contacted some of my favorite fellow bloggers and they shared some of their super simple crockpot chicken recipes with me so I could share them with you. Wasn’t that nice of them? Be sure to stop by and thank them and pin their recipes. You can also pin this collection for quick reference. Enjoy! 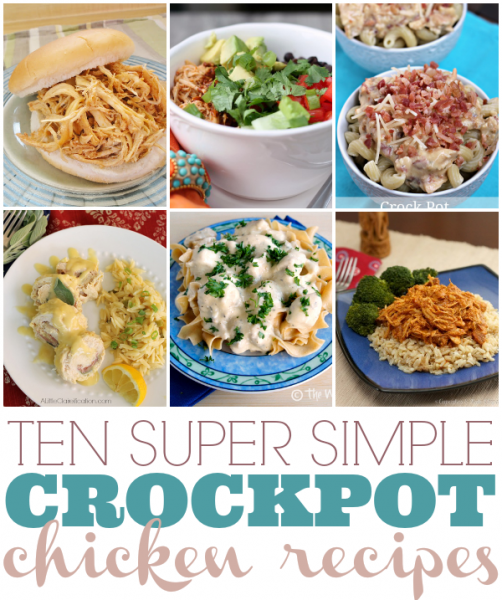 I hope you enjoyed this collection of Ten Super Simple Crockpot Chicken Recipes! Please pin your favs or this post to easily find the recipes for future use! 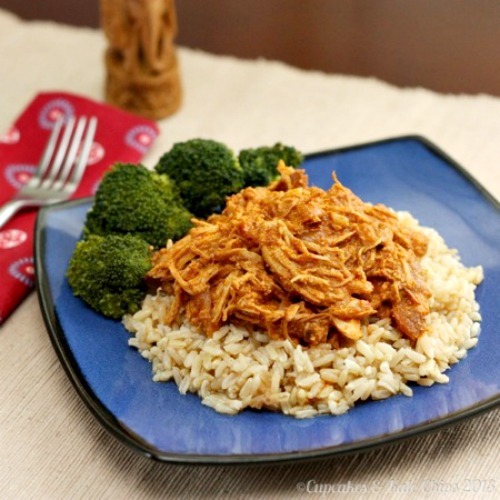 Looking for even more crockpot chicken recipes? 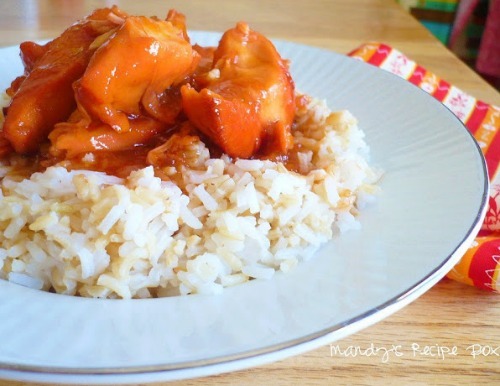 Check out this collection of 25 Easy Crockpot Chicken Recipes. Pinned it! Cannot wait to try some of these recipes! Thanks for including me, Julie! These look great. You’re welcome, Melissa! Thanks for sharing your recipe with me and for stopping by! 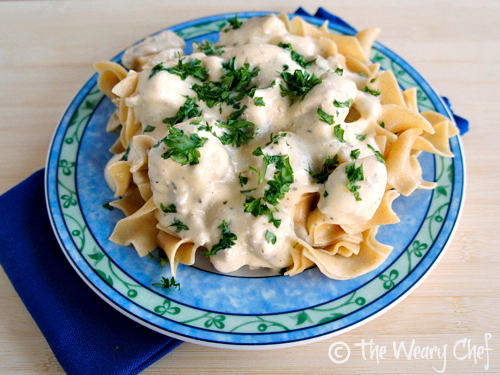 Thank you for sharing my stroganoff, Julie. These all look delicious that I don’t know what to try first! Thanks for including my Chicken Saltimbocca. Awesome round up and now I am hungry~ :) Pinning! Found you from an article you did on using Google + and then linked to the link party. But I’m so excited because it brought me to this blog post which is fab, because who doesn’t need more crockpot recipes?? Best thing for the start of school! Thanks! Thank you so much for stopping by! 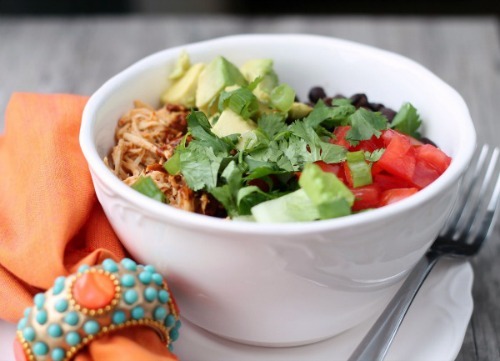 I’m glad you enjoyed this round-up, You’re right – who doesn’t need more crockpot recipes?! Now that school is starting and there’s so much to do when the boys come home…I love to already have dinner in the crock pot from the moment they’ve already left that morning. Love all of these recipes! Pinning! Hi Julie! Saving and sharing this. I just had a baby girl so I’m all about my crock pot. These all look so good. Thank you! Thank you! Absolutely perfect timing-with Fall just around the corner and me wishing it would be here this second! Can’t wait to try them all-pinning them! What a wonderful resource! Perfect for summer when it’s too hot to turn on the oven and perfect for winter when a hot meal is ideal! 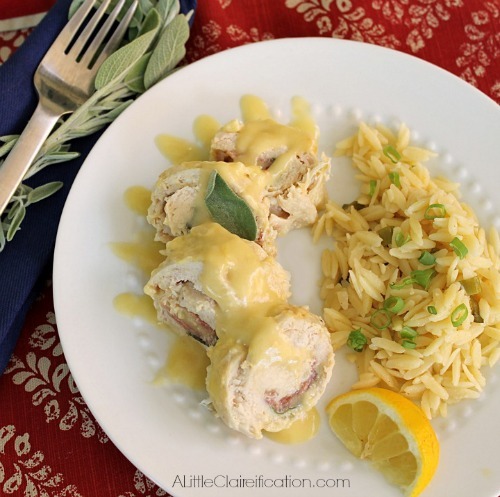 Love all of these chicken crock pot recipes, great variety in flavors! Awesome resource, pinning. Thanks for sharing at Show Stopper Saturdays Julie! I am a big fan of chicken Julie and the dishes look so delicious. I need to buy a crockpot! Thanks for sharing. Yes, you should get one, Judy! They are great for those lazy days that you do not want to cook! :) Thanks for stopping by! Oh my… I gotta love this! 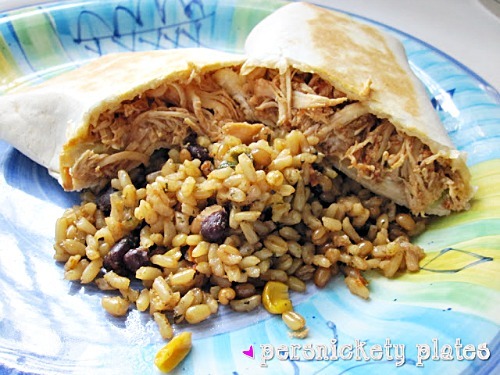 Crockpot meals during the week – OH YES! LOVE! Thank you, Julie, for a wonderful collection of recipes. 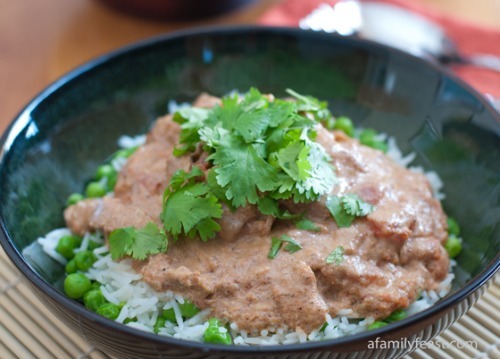 The Indian Butter Chicken is at the top of my list to try! These all look fab! Pinning! Thanks for sharing this! Simple recipes can greatly help the individuals who want to prepare easy and affordable dishes. 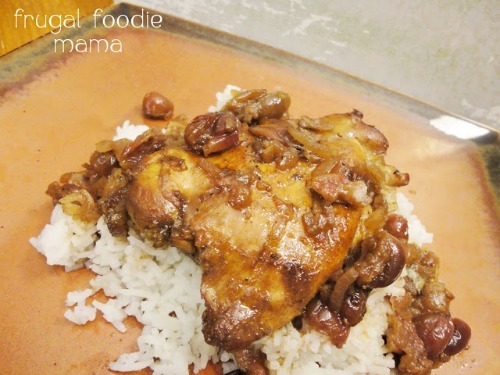 I would love to cook these chicken recipes that you have shared. 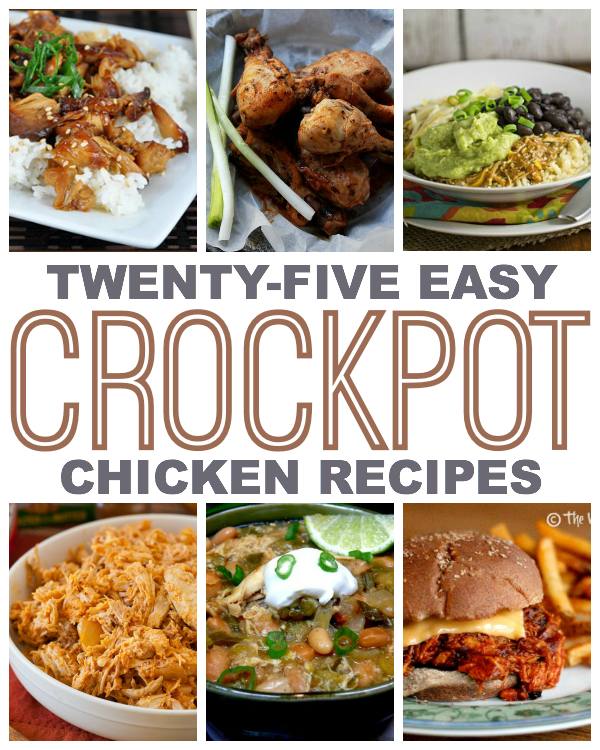 Man, so glad I came upon these easy chicken crock pot recipes! We love chicken and easy! Thanks!! I couldn’t even look at the recipes with all of these ads popping up all over the place. 4 pop-ups in 30 seconds – no thanks. Sorry admin but I won’t be back. Hmm, that’s odd. The ad settings are set to pop ups being turned off. I’ll have to look into that. You’re the first person who has ever complained. 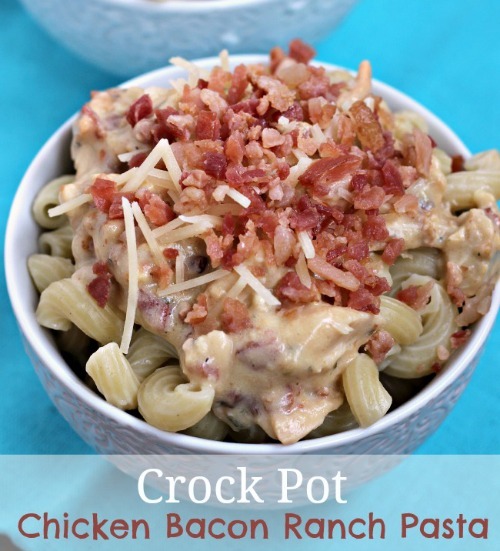 Mmm, can never have enough chicken recipes OR crockpot recipes, so this is perfect! Thanks for including my Butter Chicken.